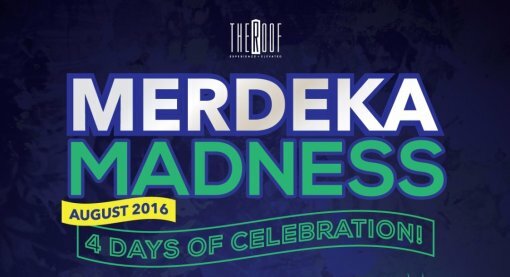 What better way to celebrate our homeland’s Independence Day than have it celebrated in a local homegrown brand – The Roof! 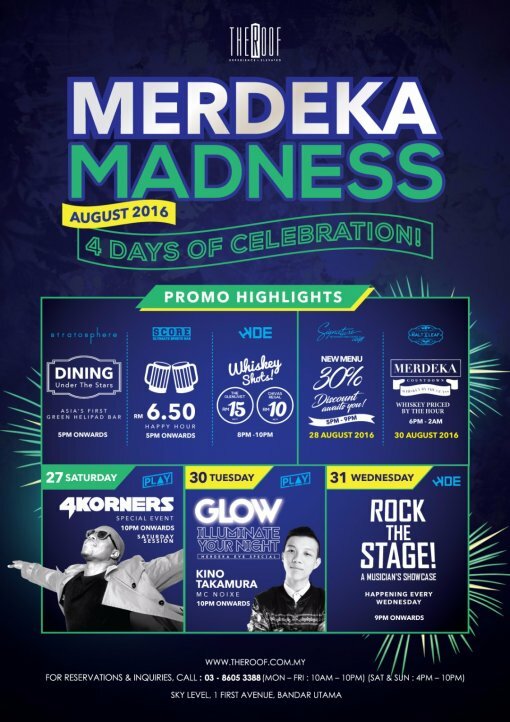 Four days of Merdeka madness is in store for you to unleash the patriotic independence spirit and at the same time, have a fun-filled celebration with your friends and family. Ranging from “Dining Under The Stars” at Stratosphere, to checking out Signature’s latest revamped menu at a discounted price or join our range of fantastic parties at PLAY while enjoying some pre-party drinks at the other outlets at a promotional price – clearly there’s something to do for everyone at Petaling Jaya’s first premium entertainment hub, The Roof. 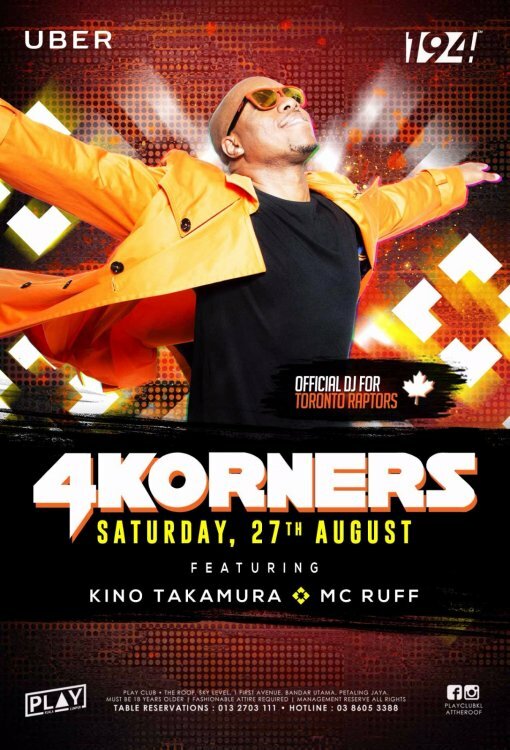 Frequently touring, 4Korners will be making his appearance at PLAY Club KL this 27 Aug (Sat). 4Korners, also known as Kirk St. Cyr is the official DJ for Toronto Raptors (Canada’s only NBA team) for the past eleven years. As a part of this, he also makes frequent appearances on the national televised basketball culture TV show “NBA XL”. He has just recently completed hosting this summer’s NBA 3on3 Streetball Tour across the country. This renowned Canadian DJ has held residencies and continues to play in clubs & concerts at Toronto’s top venues including The Docks, Lot 332, Atlantis, Mink, Lobby, and many more. 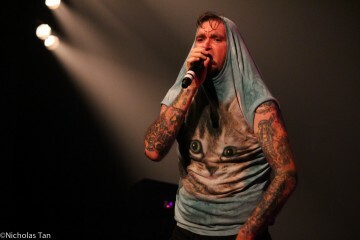 He has played alongside with some international names like Snoop Dogg, Kanye West, Busta Rhymes, Ludacris, Lil Jon and Kardinal Offishall, to name a few. Supporting DJ for the night includes DJ Def and MC Ruff. Doors open from 10pm onwards with a cover charge of RM50. Ladies will get to enter for free before midnight. Bottle packages are also available for the night. 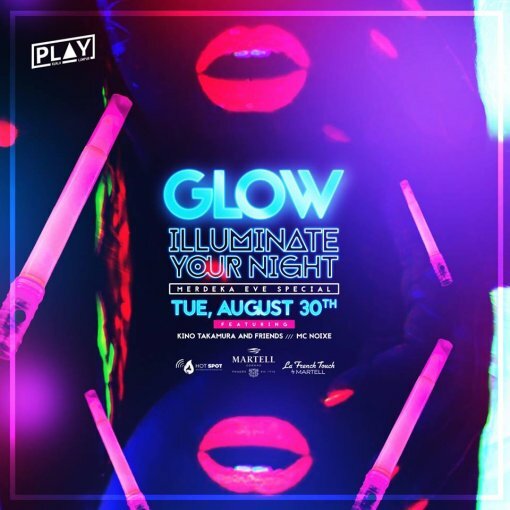 Get ready for some vibrating lights and psychedelic atmosphere in PLAY Club’s very own GLOW party this Merdeka eve (30 Aug)! Themed as “Illuminate Your Night”, this party is in collaboration with Martell as they will be unveiling a brand new electrifying limited edition of La French Touch. Along with Martell blue, this special edition VSOP Cognac comes with an exquisite bottle feature with glow-in-the dark UV effects. Used in interplay of vibrating lines, with UV ink, they create an electrifying dimension evoking the unique magnetism of the “City of Lights”’ nights; reminding us just as much of a music studio or of the center stage of a night-club or an art gallery, where one is throbbing to the beat of a musical performance. Dance the night away in UV dance floor lights surrounded by UV bubbles while getting a UV face paint and lots of neon surprises awaits you! Come support the local aspiring young musicians at “Rock the Stage” as they performed as featured artistes at HIDE this Merdeka Day from 8.30pm onwards. This initiative was introduced throughout the Merdeka month as a platform for local emerging talents to showcase their music to a larger audience. Within a month, this platform has generated tremendous response among the youth and fans and will now be a permanent feature at HIDE every Wednesday. Be entertained by the talents while sipping on our RM10 Whiskey Promo from 8pm – 10pm. For more information, kindly log on to www.facebook.com/TheRoofMalaysia. For reservations and further inquiries, please call 03 – 8605 3388.